A fish boat and a bottle of saki...the perfect dinner! 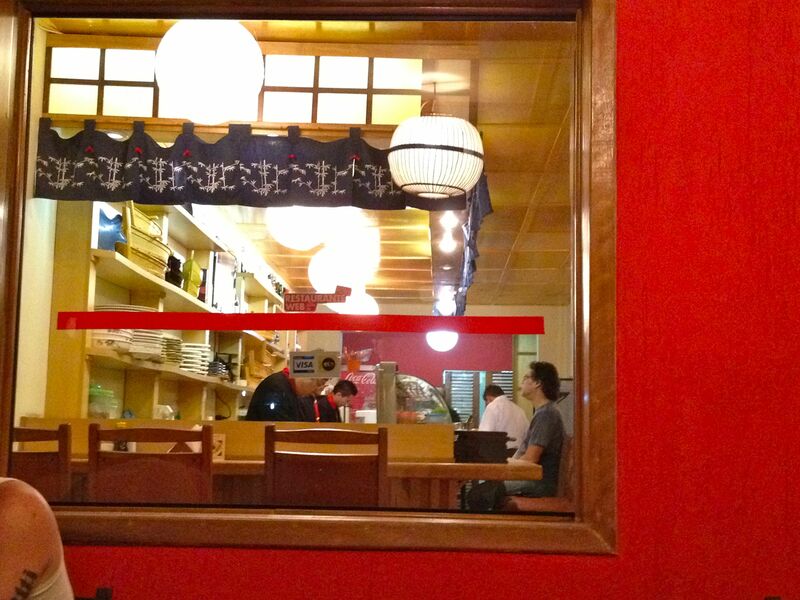 Who knew that our favorite restaurant in Sao Paulo would be a Japanese sushi bar? It’s called Sushi Nabe and it’s just up the street from us, a block away. 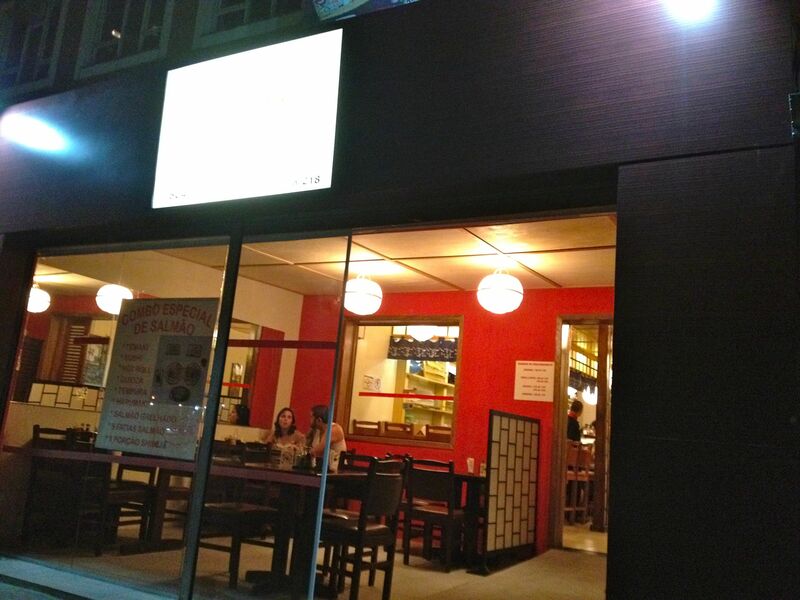 Japanese food in Brooklin! The entrance and “outdoor seating” appear to have been a garage in a previous life (in fact, when it’s closed, they just pull down an aluminum garage door), and the restaurant is long and narrow, like many of the houses around here, with a sushi bar and cabinet seating downstairs, and family seating upstairs. We like to sit on the “patio” (that’s our table by the door). 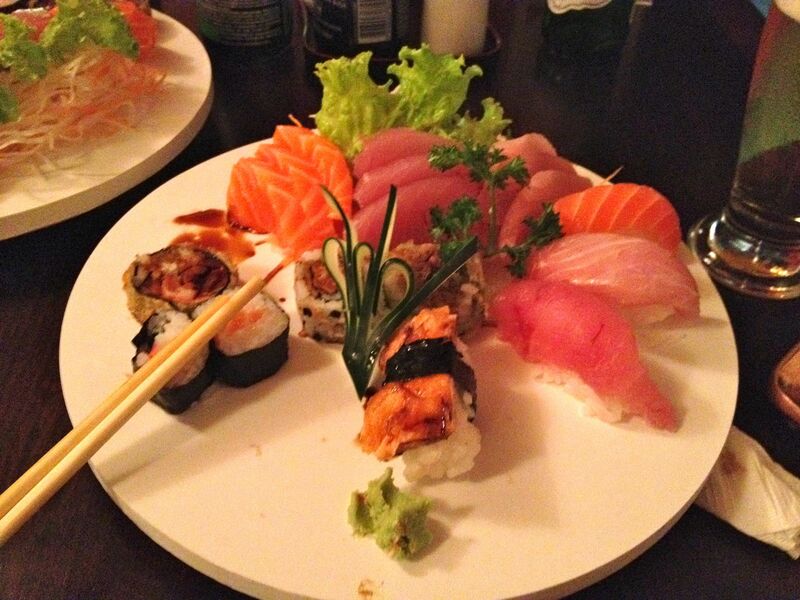 Our “usual” is the #1 Combo, for R35 a piece (about $17), which includes a wonderful mushroom dish (fresh, crunchy, and yummy), a tuna hand roll, about ten pieces of sushi, numerous pieces of sashimi, various pieces of sushi rolls, and free ice cream for dessert. Fantastic, and so light and fresh! It’s a treat to go there and eat , whether for lunch or dinner, but because we live so close, it’s also a treat to get “take out” sushi. We saw one of their fish boats being delivered one night and decided that we simply had to get one, as well (you return the boat; you don’t keep it). So when our friend came for dinner, that’s what we ordered. There was so much food that she got to take home a plate, and I had some for lunch the next day. 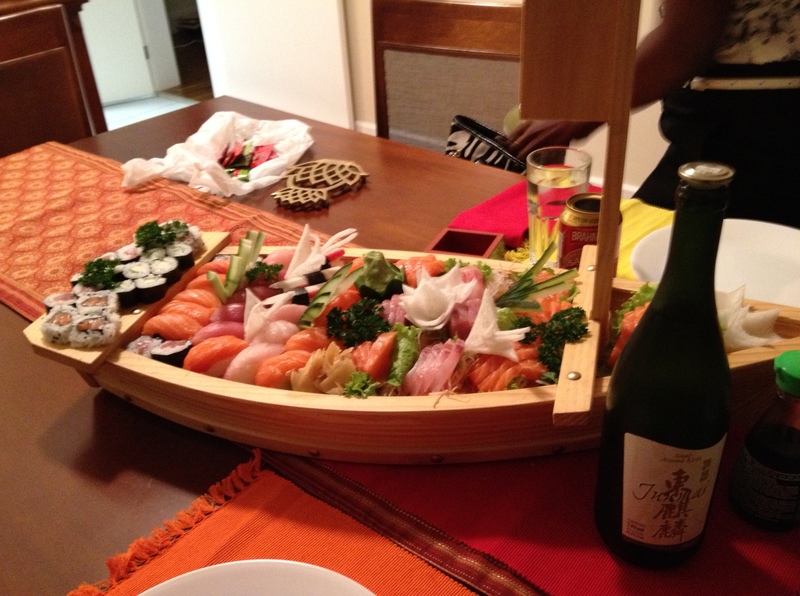 A fish boat and a bottle of saki…the perfect dinner! Looks like that sushi boat is headed for you guys at ramming speed. Delicious ramming speed. Ann, PJ and I wanted sushi this weekend and decided to try a place in Hiyannis that we had heard about. But we also intended to drink sake and didn’t want to drive forty minutes after having done so. The solution? I lovely and reasonable bed and breakfast in Hyannis just three minutes from the restaurant. And the food was great, even better than our favorite place in Boston! Glad to see you’ve found your fix so close to home! Sounds great, D! Our place is so good that I find my mouth watering just thinking about it! And if you come visit, I promise a sushi boat and bottles of saki, and a bed just down the hall! Glad to hear about the room. Don’t think I could make the drive home. Great to see Japanese cuisine making its way there, the food must have been brilliant! It’s fresh, it’s flavorful, and beautifully presented. A tiny place, but they are always busy. And many Japanese folks eating there. That must say something.